What Is a Side Cutter Presser Foot? The pictured side cutter presser foot was purchased from Amazon.com and is for a low shank sewing machine. The examples in this article were sewn using an Elna 6005 Heritage Edition. 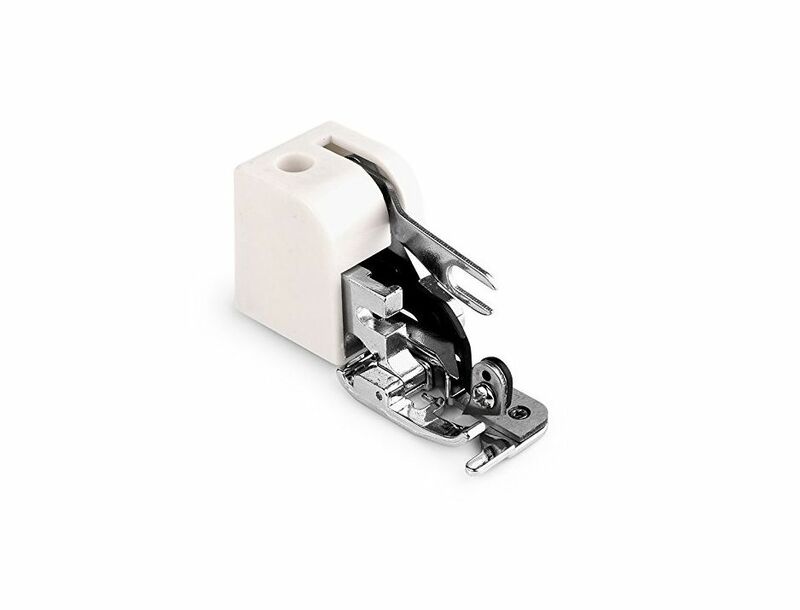 Please note that this model of the side cutter presser food cannot be used on a high shank or singer slant needle sewing machine. The foot consists of parts that allow the foot to cut the fabric and sew the edge at the same time. A: This is the part that rides on the needle clamp screw. Be sure the needle is tightly in place while you are attaching this part of the foot. B: This is where the foot attaches to the presser bar with the clamp screw. Always tighten the clamp screw securely before beginning to sew whenever you change the presser foot to prevent the needle and presser foot from having a collision and possibly damaging the machine in the process! C: This is the sharp cutter built into the presser foot. Keep your fingers away from this part of the foot to prevent injuries. D: This is a bar or needle that the threads wrap around and off of while you are sewing which encloses the fabric edge. This part of the foot also had cut edges of the fabric wrap around it to the top sewing area on some fabrics. E: This is where the fabric feeds through the foot. The foot is secured on the sewing machine as shown in the photo, and needle clearance is been tested by using the hand wheel. Before you insert the fabric, a 1 to 2 cm cut in the fabric is made in the same place you will want the cutter to be cutting. The fabric is then inserted under the cutter and under the presser foot in the areas described in the previous step (E). Stitching is begun and the thread wraps around the bar in the foot (D). As you can see in this photo, the fabric tended to wrap around the bar after it was cut. This can be eliminated by carefully watching the placement of the fabric as it feeds through the foot, but then it is difficult to watch a seam guide. With many fabrics, the wrapping actually helps to secure the edge of the fabric, so go with the tendency but sew with the wrong side of the fabric up so the fabric is wrapping to the wrong side. The pictured denim sample is sewn with a pink bobbin thread and a blue upper thread and the wrong side of the fabric facing up so that the wrapping went to the back side of the fabric. Important! Always hand test the needle clearance before you begin to sew once the presser foot is attached and secured on the sewing machine, and anytime that you change the sewing machine stitches or settings! Changes can be made while using a side cutter presser foot depends a lot on what stitches are available on your sewing machine. Stitches: Recommended stitches are a straight stitch, a zigzag stitch, a hemmer stitch, and an overlock stitch. A zigzag stitch does NOT include a stretch zigzag stitch since that stitch would cause the needle to hit the foot as it was sewing. Other stitches may be able to be used but be sure to check​ needle clearance with the hand wheel before applying power up with machine stitching. Stitch width: Almost all machines that have zigzag capabilities have stitch width adjustments. The recommended maximum widths setting is 5mm. Pressure adjustments: Pressure adjustments control how much pressure is applied to the foot. Increase the pressure if fabric feeds to the right side, the stitch appears too wide or the stitching is made inside, away from the edge of the fabric. Decrease the pressure on the foot if the fabric feeds to the left and your stitches appear to narrow. A serger cuts the fabric and binds the edge of the fabric so is it the same as having a side cutter presser foot for your sewing machine? In one way yes. It does bind and cut the edge of the fabric, but a serger has many more options than a sewing machine does not have. The first marked difference is that a serger is much faster. A serger has a feed variation for different results. Depending on the model of the serger, you can have many more stitch options and stretch stitches that can not compare to a side cutter presser foot on a sewing machine. Side cutter presser foot is much less expensive than a serger but it will not replace a serger.